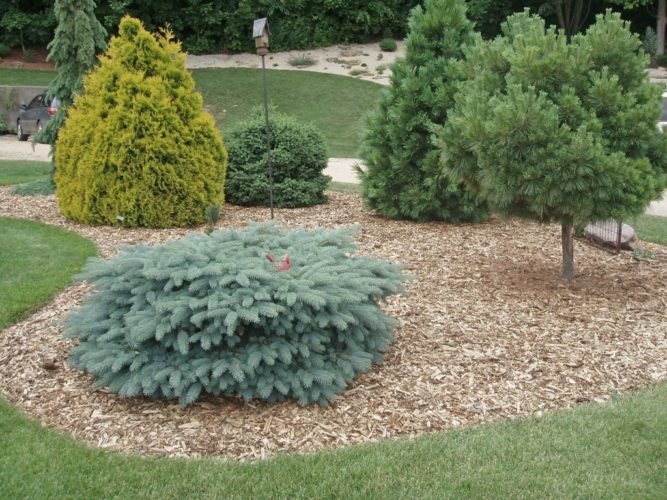 Picea pungens 'Millbrook' is a spreading dwarf selection of Colorado spruce. It is generally bun-shaped, but the lateral branches grow with slightly weeping habit, presenting the overall appearance of an umbrella. Although Millbrook's color is not as intensely Blue as P. pungens 'Globosa,' it is more elegantly groomed with a softer appearance. Typical rate of growth in most areas is 4 to 6 inches (10 - 15 cm) a year resulting in a flattened dome, 1.5 feet (05 m) tall by 4.5 feet (1.35 m) wide after 10 years in the landscape. C.J. "Joe" Stupka, of Pulaski, Pennsylvania is credited with the origin and the nomination of this cultivar. In the late 1990s, he found the original witch's broom in a neighborhood in Jamestown, Pennsylvania. He collected and numbered several scions from this broom and selected [Millbrook #1] as the most suitable for propagation and began distributing young plants to a few conifer collectors in the midwest. In 2008, Jay and Terri Park took scionwood to Gary Gee and his namesake nursery in Stockbridge, Michigan for use in a grafting class and eventual introduction to the nursery trade. Joe recommended grafting 'Millbrook' on a high standard to better display its weeping tendency. It has been noted that this selection is potentially not as easy to propagate as some selections of P. pungens. In 2012, Teresa "Terri" Park, DVM, of Carmel, Indiana officially registered this cultivar with the Royal Horticultural Society via Dawes Arboretum. 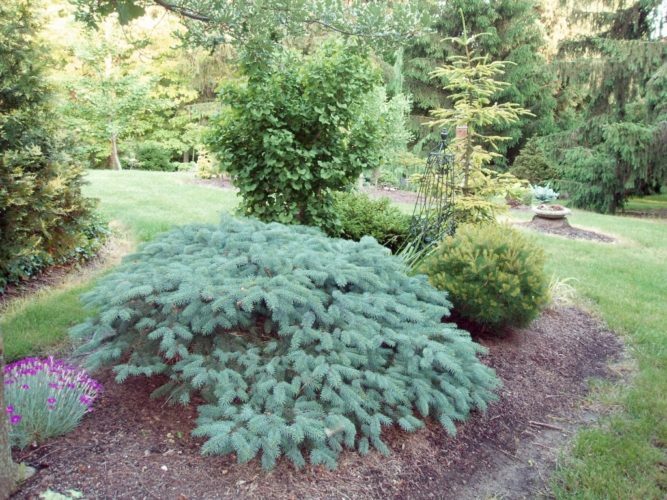 Picea pungens ' Millbrook' at Parkwood Garden, Carmel, Indiana. <em)P pungens 'Millbrook' at Dave Horst's garden near Clinton, Iowa.